Taylor & Associates • In The News And On T.V. Nigel B Taylor is often asked to contributed to local, regional and national newspapers, magazines, periodicals and television stories. If you need assistance with an article or feature and your deadline is more than 3 days, please call contact us via E-mail. Please let us know which publication you work for and when your deadline is. We generally respond to journalist inquiries within 4-6 hours. If your on a short deadline, please call 310. 260. 1126. If no one is available at that number, leave a return number, your question, and your deadline. We generally return calls within 2 hours during a normal business week. 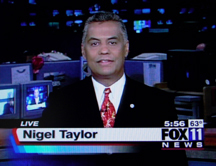 July 15, 2010 Nigel B Taylor, CFP® was extensively quoted in an article calling for increased regulation of Equity Indexed Annuities and a stop to abuses in the senior citizen market published by Financial Adviser Magazine and the Wall Street Journal. June 2010 Nigel B Taylor, CFP® was extensively quoted in an article titled "Investment Advisers weigh in on U.S. Financial Reform Bill" published by Reuters in multiple outlets. February 22, 2009 Nigel Taylor, CFP® was quoted in an article regarding fiduciary standards for CFP® Certificants in the weekly trade magazine Investment News. March 8, 2008 Nigel B Taylor, CFP® was interviewed and quoted extensively in a Money Magazine article titled "Financial Odd Couples". May 2004 "Consumer Reports Subscription Magazine "Money Adviser" Nigel Taylor, CFP® was interviewed for and quoted in an article regarding how to handle "Sudden Money" such as windfalls and large inheritances. This magazine, produced by Consumer Reports, is available by subscription only. October 2003 "Investment Advisor Magazine" Nigel Taylor, CFP® was extensively quoted in an article regarding the ethical challenges facing financial planners and how to handle ethics issues and ethics challenged clients. April 3, 2003 "Investment News" Nigel Taylor, CFP® was interviewed and quoted regarding this important legislation passed in Arkansas, which deals with restrictions for use of the title "Financial Planner" by insurance agents in Arkansas who only offer insurance services. March 25, 2003 "Financial Planning Magazine" Nigel Taylor, CFP® was extensively quoted in an article regarding recent legislation passed in Arkansas regarding restrictions for use of the title "Financial Planner" by insurance agents in Arkansas who only offer insurance services. March 3, 2003 "Investment News" Nigel Taylor, CFP® was extensively quoted in an article regarding the CFP Board’s decision to issue an advisory opinion on the correct usage and definition of "Fee-Only" by CFP® Certificants in a financial planning arrangement. Mr. Taylor is of the opinion that fee-only should mean an hours work for an hours pay, and not as many fee-only planners define it, a percentage of assets under management, which is better defined as "level first year commissions". February 2002 "Bloomberg Wealth Manager" Nigel Taylor, CFP® was extensively quoted in an article titled "Into Foreign Territory" written by Alan Feigenbaum, which dealt with the financial, estate and asset protection issues facing foreign nationals and residing temporarily in the United States. August 26, 2002 "Investment News" Nigel B. Taylor, CFP® was extensively quoted in an article titled "Going Crazy Over Credentials", which addressed the increasing concerns in the industry to the growing number of meaningless financial planning designations. August 29, 2002 "Investor’s Business Daily": Nigel B. Taylor, CFP® was extensively quoted in a feature article published on 08. 29.02. in Investor’s Business Daily. The article, written by Julie Huynh, a staff writer with IBD discusses the importance of engaged couples speaking openly about their finances BEFORE they finally tie the knot. If you are planning to "get hitched" in the near future, plan on getting together with a member of our firm first! September 15, 2002 "Physician’s Financial News" Nigel B. Taylor, CFP® was extensively quoted in the September 15, 2002 edition of "Physicians Financial News", the leading financial magazine for the medical profession. The article addressed potential liabilities and the asset protection techniques that can be employed to protect assets from aggressive creditors. If you have have concerns regarding potential creditors and are exposed to increased levels of liability because of your professional career or personal wealth, please contact us immediately! We can help! October 3, 2002 "Wall Street Journal On-Line Edition" Nigel B. Taylor, CFP® was quoted in the Terri Cullen article, which discussed the importance of laddering bonds and CD’s to achieve a higher yield on these fixed investments. Contributor, "Protect Your Assets" Written by Richard Boothe, Spring 1998, Senior Saver. Contributor, "Dual Citizenship Issues" Written by Donna McKenna, January 1999, Ticker Magazine. Numerous Quotes throughout 1999 in magazines and newspapers such as Ticker, Financial Planning, Dow Jones Investment Advisor, Registered Representative, The Los Angeles Times, L.A. Business Journal, Money Magazine, CNN Money etc. Biography and Feature Article Regarding my Practice, "Financial Planning", February 2000.